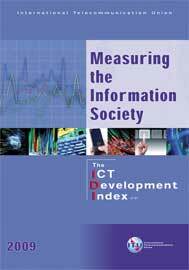 The latest edition of Measuring the Information Society features the new ITU ICT Development Index. The Index captures the level of advancement of ICTs in more than 150 countries worldwide and compares progress made between 2002 and 2007. It also measures the global digital divide and examines how it has developed in recent years. The report also features a new ICT Price Basket, which combines fixed, mobile and broadband tariffs for 2008 into one measure and compares it across countries. The analytical report is complemented by a series of statistical tables providing country-level data for all indicators included in the Index.